Geworge Graham Reviews Natalie Merchant's "The House Carpenter's Daugher"
Ever since the mid-1960s emergence of Bob Dylan, for most people, "folk music" has come to mean acoustic-guitar strumming singer-songwriters. But up until then, folk music meant old songs by anonymous authors passed down through the oral tradition. Artists who did their own music would likely encounter howls of protest from the folk purists. Today, there are few performers recording who could be considered folk musicians in the classic sense. But that has not stopped artists from incorporating some occasional traditional material on their recordings, and indeed we seem to be in another of those periodic revivals of interest in such music, helped to some extent by the popularity a couple of years ago of the old-time folk oriented soundtrack to the film O Brother Where Art Thou? This week, we have a fine example of a capable and well-known singer-songwriter turning to traditional music for her newest album and giving the old music a different twist. 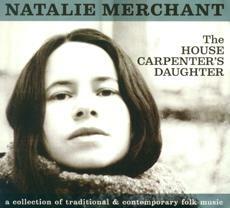 Natalie Merchant has released a new CD called The House Carpenter's Daughter. Natalie Merchant is known for her decade with the popular upstate New York band 10,000 Maniacs who emerged in 1983 with an intriguing blend of atmospheric alternative rock with astute lyrics. After four solo albums in the conventional singer-songwriter mode on major record companies, Ms. Merchant, having launched her own label, decided to delve into what she calls "traditional and contemporary folk music." And like many before her, she writes in her notes in this very attractive booklet styled CD speculating about just what folk music is. And her answer is described in theCD's subtitle -- music that running from very old, and very traditional, to semi-traditional material from the Carter Family, to music by the English folk band Fairport Convention from the 1960s, to a song by two of the musicians who perform as her backing band on the CD. And while Ms. Merchant's goal was to do traditional music, the arrangements are rather eclectic, blending a plaintive banjo with occasional rock-band instrumentation. For the most part, her performances have a kind of dark, brooding quality, in some ways reminiscent of the music of Gillian Welch, who is also known to use electric guitar. The result is a fascinating album that blends both familiar songs and somewhat obscure material with creative musical approaches. Ms. Merchant's intrinsically melancholy vocals are a perfect match for the material, and even when she and her group take considerable liberties with the songs, the result is always tasteful. Her band on the CD includes Graham Maby, the former bassist for Joe Jackson's band, Erik Della Penna on guitar and lap steel, Elizabeth Steen on keyboards, including a rock-style organ, Alison Miller on drums, and the two former members of the Ithaca-based Horseflies, a wildly eclectic old-timey band with synthesizers, fiddler Judy Hyman and banjoist Richard Stearns. After a 20 year career first with 10,000 Maniacs and on her own since the mid 1990s, Natalie Merchant, on her fourth solo release, The House Carpenter's Daughter, creates a CD that lives up to its subtitle, "a collection of traditional and contemporary folk songs." Folk music purists might take issue with the often electric instrumentation, but eclecticism was a goal of the recording, putting new spins on old songs without losing their basic direction and mood. The often somber arrangements, though imbued with rock instrumentation, can combine with some of the lyrics about murder and unfaithfulness, to create music that's downright striking in sound. Ms. Merchant proves to be a brilliant re-interpreter of the old songs. About an A-minus is our grade for sound quality. Ms. Merchant's vocals are well recorded, and the mix enhances the atmospheric quality of the music and arrangements. But the dynamic range, the difference between soft and loud passages, is only mediocre. It has often been said that the old songs are the best ones. That is not always the case, but Natalie Merchant's new CD The House Carpenter's Daughter casts an interesting light on some of the good old folk songs.